The IsoClean is the most versatile unit in the Hospi-Guard product line. A mobile unit, the IsoClean can be set to exhaust and used to create a negative pressure isolation room for a TB patient, and then can be rolled down the hall and set to recirculate to protect a bone marrow transplant patient from airborne disease. With 156 ft2 of 99.99% HEPA media, the IsoClean's filter outlasts comparable units' filters. The Hospi-Guard lsoClean is a portable, self-contained HEPA Filtration system that can be used to easily and economically create a negative pressure isolation room. The versatile IsoClean can be used as a recirculating air cleaning unit or as a split system for negative pressure isolation rooms. When used as a split system, the user can recirculate clean air into the room and simultaneously exhaust air out of the room to create negative pressure and a high number of air changes per hour. Since all air passing through the unit has been thoroughly cleaned by HEPA filtration to a minimum of 99.99% at 0.3 micron, exhaust can be vented to the outside through a window or wall, or back into the main ventilation system simply by connecting flexible ducting to the available exhaust port. 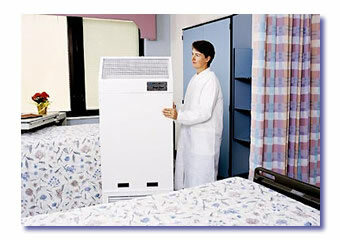 The Hospi-Guard IsoClean HEPA filter contains 156 square feet of media. This filter is capable of capturing 99.99% at 0.3 micron. The large filter media area means that filters can be used for long periods of time before loading occurs, so fewer filter changes are necessary. The Hospi-Guard lsoClean is the easiest and most economical way to create a negative pressure room. Use as a total recirculating unit or choose to exhaust a percentage of air to maintain negative pressure. For effective use in a variety of room sizes. Combined with high to low air flow, assures adequate "reach" and room mixing preventing "short circuiting." The IsoClean fits in small rooms with limited space. Filter and prefilter are easy to replace. As low as 52 dBA. This unit will not disturb those nearby.